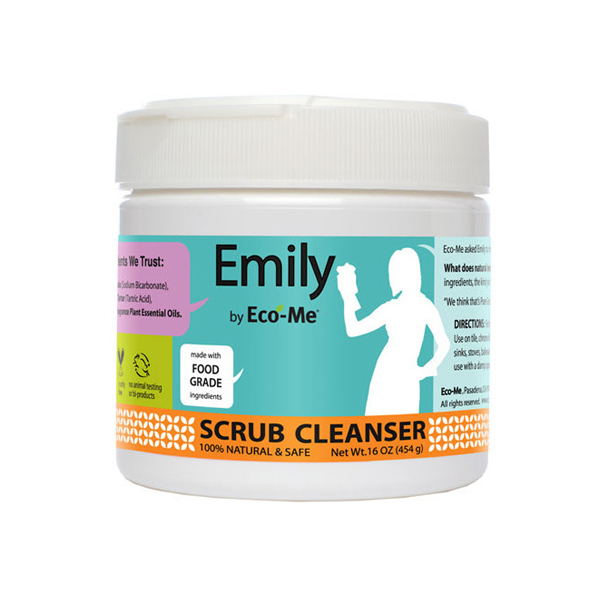 SCRUB CLEANSER: Emily By Eco-Me asked Emily to mix natural ingredients for a safe and effective Scrub Cleanser. What does natural mean to you? For Emily it means pure ingredients the kind you find in your pantry. Natural cleaning product based on simple household ingredients and pure plant oils. Premixed Cleaning Product, Ready to use. Great for all household cleaning including kitchens and bathrooms; for use on tile, grout, counters, ovens, stoves, showers, sinks (porcelain & stainless steel), tubs, toilets, floor and wall scuff marks. Vinegar and Baking Soda based cleaners reduce germs, bacteria, dirt, odor and grime. Basics that work tougher than chemicals. Helps to eliminate bacteria and germs! Healthy Clean for a Green Home. 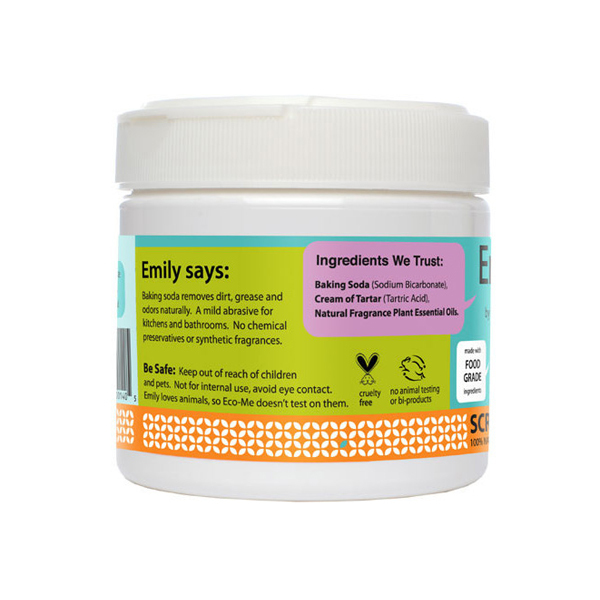 Emily loves animals, so Eco-Me doesn't test on them. Sodium bicarbonate (baking soda)*, Potassium Hydrogen Tartrate (Cream of Tartar)*, Pure Plant Essential Oils (Tea Tree, Lavender, Rosemary, Lemongrass). Baking soda removes dirt and odor; plus a gentle abrasive! Cream of Tartar, a natural acidic salt, adds a healthy cleaning boost. Great for all your bathroom & kitchen cleaning needs. Use on sinks, toilets, tubs, showers, tile, grout, ovens, stove tops, cook and bake ware and more. Sprinkle onto a damp sponge or cloth. Gentle abrasive. Shake before use to loosen powder. Emily by Eco-Me contains natural ingredients, that are not meant for internal use, eye contact should be avoided.